A little change in usage habits can have weird and wonderful effects on your iPhone’s battery health. Here’s what I did and persevered 99% battery health even after one year of usage. I’m not going to dive into the scientific and technical aspects of how batteries work as there are a ton of articles out there that highlight this. I’ll simply talk about what I did to make sure that my iPhone X’s battery stayed at 99% health before upgrading to the iPhone XS Max at the end of 2018. Usually, this is believed to be the best and most common practice for charging an iPhone battery: you unplug it from the charger in the morning, and top it up before going to bed when the battery has completely died or is about to give up the ghost. That’s the best way, only if you want to damage the battery to smithereens by the end of the year. Trust me, I’ve seen people drop their battery health to the 85% mark within 4 months of usage, which is no less than a miracle and something which you try to pull off at all. Follow the tips/guidelines below and you’ll preserve your iPhone’s battery health like a champ. And no, it’s not a hard thing to do at all. It’s just a change of habit which will eventually be hardwired into you down the line. Note: All of these tips are applicable and effective if you are using the original or a MFi-Certified Lightning cable and charger along with a Qi certified wireless charger as well. Knockoff products will harm your iPhone. These steps are applicable to Android phone and iPad as well. Also, follow these steps if you are planning to keep your iPhone with you for an extended period of time. 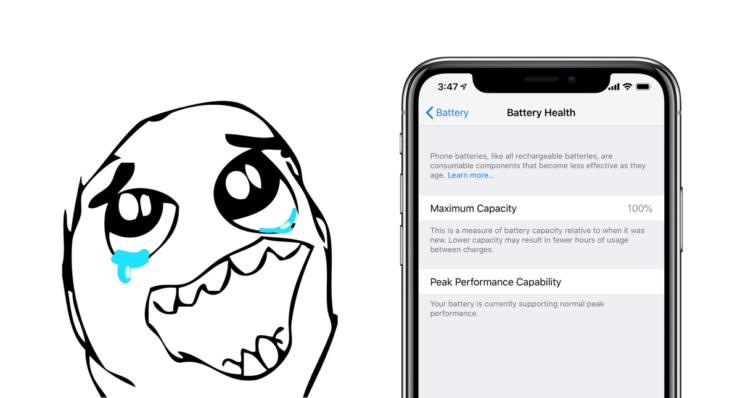 You can check your iPhone’s current battery health by going to Settings > Battery > Battery Health. If your iPhone is being throttled due to bad health, you’ll find that here as well. Whenever you are using your iPhone to make calls, send text messages, check social media, keep it unplugged unless you really have to use it. If you are not using your iPhone and happen to be near a power source, whether it’s wired or wireless, put your phone on charge. It’s completely fine. The electrons inside your battery love to move around therefore no damage will be done. Do not worry about overcharging at all. The iPhone is smart enough to stop charging the battery and switch over to AC power as long as it’s plugged in. In other words: you can even leave it plugged overnight. Going to a commute somewhere and have a car charger too? Plug your iPhone in during the drive. Besides, you’re not going to use it during your drive anyway so why not top it off with some power, right? Try and make sure that the battery does not drop below the 75% mark that often, even if it does, keep the 60% mark as a benchmark for ‘critical.’ This might sound a little absurd, but if you’re following the above tips religiously then it should’t be a problem. Occasional drops below that point are fine. If you do manage to deplete your battery to a critical mark, make sure you top it off as soon as possible. A very drained or completely drained battery will only get damaged faster. Carrying a backpack? Carry a power bank too. They come in all shapes and sizes. Choose the one that is extremely portable and will help you get through your day. Place your wireless chargers in a strategic manner around your house. As long as they are in your arm’s reach, you can keep your iPhone on charge whenever not in use. For example, if you are working on your computer, just put your iPhone on charge right next to it. Do not charge your iPhone in extreme weather. You’ll only do harm to your phone’s battery. If it’s too cold, put it in a case or a pocket during charge to keep it in the ‘room temperature’ zone. If it’s too hot, keep it well ventilated. Though the above guidelines might seem like too much work but trust me, it isn’t. A close friend of mine followed half of the steps last year and he managed to have 96% of battery health by the end of the year, which isn’t bad at all. Also, I got my iPhone XS Max on day one, and guess how much battery health I have currently? 100%. It’s totally doable, it’s just a change of usage habits that will help you get there.